Part of the problem with American Crime this season for me has been how expansive and disjointed the world has been. I know that that doesn’t bother everyone, but it has made it harder for me to get really invested in the stories at times. Sunday’s (April 23) episode, however, felt different. I think it was the constant state of tension it held. I was on the edge of my seat for every storyline, even the ones that turned out to be not as high stakes as others. Gabrielle and the Coates family took center stage in the high stakes department, as Gabrielle revealed another, this time much more severe, injury on her arm. She finally decides it’s time to get out, and she might have been able to escape cleanly if she hadn’t decided to bring Nicky with her. I get why she did it—not only is that an unstable and possibly dangerous house for him to be living in, but he obviously reminds her of her own son—but that was a huge mistake on her part. Of course, with no passport I’m not sure how far she would have gotten anyway, but at least maybe the Coates family would be firmly in her rear view. As it stands, Gabrielle’s future remains very uncertain right now. This plotline has really grown on me. Regular readers know that I wasn’t a fan of it initially. I didn’t like how the show wrapped up the Isaac/Teo/Luis thread so abruptly and seeming substituted this one in its place. It also seemed to me like Nick Coates was obviously the villain of the piece and that felt a little uninteresting. Kudos to the show for taking it another way and making Claire the real monster. Don’t get me wrong, Nick is still a top-notch a-hole. But she’s on another level and now looking back, I actually like how the show left that purposely vague for quite a while. Count me as one who was completely duped by Claire, hoping she would turn out to be a good person. I don’t fault her for wanting one at all. Kids are hard under the best circumstances. It’s just a shame that taking a break means getting high. I don’t buy for one second that this is the county “making a mistake” in her drug test. She knew she was going to fail and honestly, it might even be a relief for her now, thinking that perhaps Jeanette will go back to Carson and take her two nieces to a better life. It’s really about the best outcome right now, even if Jeanette does feel a bit trapped. But think of what she and Carson could provide those girls—and what they could provide Jeanette. No, she’s not going to be 100 percent happy, but it would give her life some purpose and hopefully also break the cycle of poverty and drugs for Raelyn’s branch of the family. With American Crime, that might be about the closest we can hope for a “happy ending,” not that a show like this should have those because that’s very unrealistic. But it would be nice to see one small bright spot in such a pit of despair. One other bit of closure I do hope we get in the season finale next week is with Shay. It’s probably asking too much, but since Dustin found his way to Kimara, I’m hoping she’ll find out about Shay and maybe at least bring that girl some justice by shutting down the webcam house. Of course, that’s if Kimara makes it safely to working for Abby’s shelter without getting caught fudging the numbers. This week made it seem as though she’s OK in that regard, but I wouldn’t put it past this show to yank the rug out from under us, especially with the benefactor working with the non-profit in such a hands-on capacity. I’m still very nervous for Kimara. And that’s really what made this episode stand out so much for me. I was in a constant state of worry for so many of the characters, whereas in the past couple episodes, that tension hasn’t really been there. It’s partially because of the storylines reaching a bit of a climax, but it’s also just the look and feel of this episode. The music, the way it was shot—everything felt very high stakes in a way I haven’t felt since early on this season. 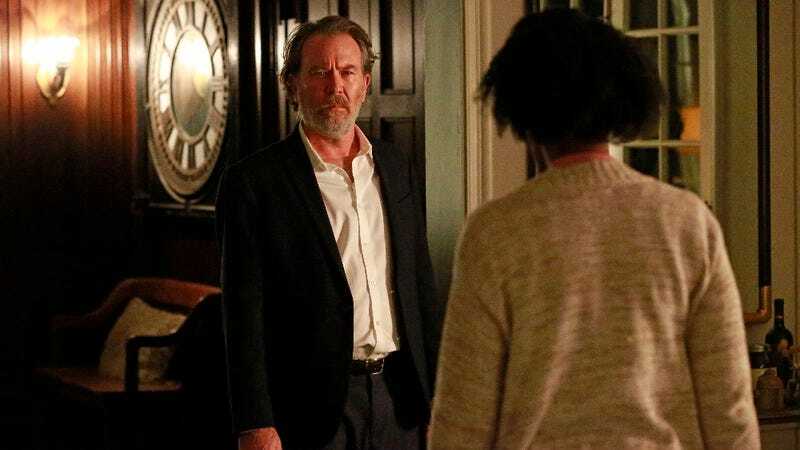 I do realize not every episode can be like this one, but I think American Crime suffered a bit in the middle of the season by being so disparate. But if “Episode Seven” is any indication, Season 3 is going to wrap up with a couple very strong episodes. People have been wondering why I was so high on this season to begin with and then became so critical. Just to clarify, I watched the first two episodes of Season 3 way back in December and I liked them a lot. Upon rewatching the second episode for these reviews, I wasn’t as big on it as I was the first time around; I also didn’t watch episodes 3 and 4 until it was time to do the weekly reviews for them. If I’m going to do episodic reviews, I prefer not to have watched ahead. I hope that clears up any confusion. It was nice to see the return of J.D. Hesby, though that quickly turned to disappointment when we found out he’s going to jail for the fire. Jeanette nailed it when she guessed that Laurie Ann must have talked him into it. Oh, J.D. But this also illuminates one of my on-going problems with Season 3—there are too many storylines. I still kind of feel that way, because I find myself wishing we had seen more of both J.D. and Laurie Ann this season. Laurie Ann could have been a really interesting character—she’s the oldest child, so she’s in charge of the farms with their father in ill health. But she’s a woman, so that probably presents its own set of challenges in that field. Does it make her have to be harder, tougher? Or is she just truly a rather heartless business owner who only cares for the bottom line? I would have loved to explore her character more. Same goes for J.D., Isaac, Coy—the list goes on. But there just wasn’t time or room for them and that’s a shame. These two are really a piece of work, huh? Just awful, awful people, though Timothy Hutton, Lili Taylor and Mickaelle X. Bizet are killing the material. Do you think Gabrielle will go the way of Shay in the sense that we won’t see her in the finale to wrap up her story? She’s just in the hospital and there’s no closure? I hope not, but it’s hard to say.